Below is a list of healthy and nutritious recipes. Just click on any recipe to expand the description and instructions. Click again to close the recipe. For more recipes, go to my blog and search for recipes in the search bar. Flatten chicken breasts (if desired) and dredge in flour and oregano. Over medium-high heat cook chicken in two non-stick skillets for 5 minutes on each side. Remove and keep warm in oven on low. Add onion and garlic to pans and sauté 3 minutes Add broth, raisins and lemon juice. Cook another 3 minutes scraping pan to remove any bits of browned chicken. Return chicken to pan, cover, reduce heat and simmer another 10 minutes or until done. Remove chicken from pan to serving plates. Add capers and cheese to pan, stir. Top each piece with ¼ cup of the sauce and a lemon slice. Serve with: Orzo tossed with oregano. In a large bowl, mix oil, brown sugar, egg, sweet potato and carrot together. In another bowl mix dry ingredients together and add to yam mixture and gently mix just until ingredients are combined. Spoon into paper cup lined muffin tin. Bake at 350 for 18 minutes. Makes 12. Tip: to cook 8 ounce sweet potato, place in boiling water and simmer about 25 minutes until fork tender. Peel and mash. There are two groups of Vitamin A, depending on whether the food source is an animal or a plant. Vitamin A found in foods that come from animals is called Preformed Vitamin A. It is absorbed in the form of retinol, one of the most utilizable forms of vitamin A. Sources include liver, whole milk, and some fortified food products such as breakfast cereal. Vitamin A that is found in colorful fruits and vegetables is called provitamin A carotenoid. They can be made into retinol in the body. Common provitamin A carotenoids found in foods that come from plants are beta-carotene, alpha-carotene, and beta-cryptoxanthin. Orange and yellow vegetables contain significant quantities of carotenoids. Major food plant sources of provitamin A carotenoids are carrots, sweet potatoes, cantaloupes, and spinach. Green vegetables also contain carotenoids, although the pigment is masked by the green pigment of chlorophyll. The Institute of Medicine suggests consumption of all carotenoid-rich fruits and vegetables for their health-promoting benefits. Even children who are only mildly deficient in vitamin A have a higher frequency of respiratory disease and diarrhea as well as a higher rate of mortality from infectious disease compared to children who consume sufficient vitamin A. Brown rice, which has only the outer hull removed, retains--along with its bran layer--an impressive variety of vitamins and minerals, including niacin, vitamin B6, magnesium, manganese, phosphorus, selenium, and even some vitamin E. Brown rice contains only a small amount of protein, but it is of good quality because of its relatively high level of the amino acid lysine. Because the bran is not milled away, brown rice contains four times the amount of insoluble fiber found in white rice. Beef is an excellent source of protein, iron, zinc, and vitamin B12. The cheese contributes calcium and protein. The tomatoes in the spaghetti sauce are one of the best sources of lycopene, a carotenoid with cancer and heart disease fighting properties. Onions are low in calories and are a rich source of a number of phytonutrients. They contain allyl sulfides (sulfur compounds that may lower blood pressure and discourage tumor growth), quercetin (a flavonoid with high antioxidant activity), and saponins (substances connected with cholesterol-lowering and tumor inhibition). Cook brown rice 10-15 minutes less than package directions. Meanwhile, brown ground beef and optional onion in a large skillet. Drain any fat. Add spaghetti sauce and simmer 5 minutes. When rice is done, in a large bowl, mix together 5 cups cooked brown rice with the cottage cheese. Preheat oven to 375. Lightly oil a 9 x 13-inch casserole dish. Spread 1/2 of the rice-cottage cheese mixture, then 1/2 ground beef-sauce mixture. Continue alternating layers ending with the ground beef-sauce. Top with grated cheese. Cover loosely with foil. Be careful as the foil will stick to the cheese as it bakes. Bake for 45 minutes until bubbly. Remove from oven and let stand 5 minutes. Serves 10. Cut tofu into ¼ inch thick lengthwise slices. Brush barbecue sauce over tofu. Put on foil and broil for up to 4 minutes each side or until bubbly. Watch carefully-it tends to burn easily! Cut into strips. Place three tablespoons cheese on each tortilla. Microwave for 30 seconds to slightly melt cheese. Put a few strips of tofu, a tablespoon of sour cream, tomatoes and salsa on tortilla and roll up. Put a large paper towel in a colander and set it in a sink. Put dry quinoa in a bowl, cover with water, stir then pour into the paper towel lined colander. Throw paper towel away and replace paper towel with another one and place colander in sink. Pour rinsed quinoa into a pan with 4 cups water and ½ tsp salt. Cook according to instructions. Drain into paper towel lined colander. Toss salad ingredients, vinaigrette with the warm quinoa. Heat oven to 400. Mix parmesan, breadcrumbs, salt and pepper in a large shallow bowl. Beat eggs in another large shallow bowl. Pound each turkey or chicken breast to 1/2 inch thickness. Dip each turkey or chicken fillet into egg white than dredge in breadcrumb mixture, turning to coat all sides. Set aside. Heat oil in a large nonstick skillet over medium high heat. Add turkey or chicken and cook 3 minutes each side, until golden brown. Meanwhile, spray a large baking dish with oil spray or coat with oil. Remove turkey from skillet and place in baking dish I one layer. 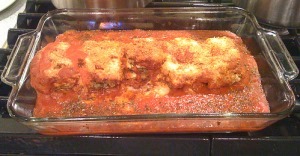 Pour marinara sauce over top and sprinkle with cheese. Bake seven to ten minutes, until cheese melts. Approximately 410 calories per fillet, 59 grams protein, 16 grams carbohydrate, 13 grams of fat. This salad is flavorful, colorful, nutritious and lasts in the fridge for several days. It will become one of your favorites! To roast corn : Brush two ears of shucked corn with olive oil. Grill 5 minutes. Cool and slice corn off cobs. Mix corn with rest of ingredients. Cut tofu into 2 by 3-inch rectangles. Drain tofu in colander on paper towels about 20 minutes. Change paper towels as needed. Meanwhile, combine wheat germ, basil, salt and pepper in shallow bowl. In another bowl, beat eggs. Coat a baking pan with non- stick spray. Dip tofu pieces in egg and then in wheat germ mixture; turn to coat all side. Place tofu on baking pan and bake 30 minutes at 375. Top with spaghetti sauce, mozzarella and Parmesan. Return to oven and bake 15 minutes until cheese melts and sauce is hot. Sautéing the vegetables before adding the broth is the secret to this soup’s great flavor. Wash and chop all vegetables. In a 6-8 quart pot, heat olive oil over medium heat. Add carrots and onion. Cook and stir 2 minutes. Add cabbage and kale. Cook and stir 6 minutes. Add green beans. Cook and stir 3 minutes more. Add chicken broth, tomatoes and zucchini. Cover and simmer for 20 minutes. Stir in beans. Return to boiling. Cover and simmer 15 minutes more. Stir in chopped basil. To reduce the sodium, use reduced sodium chicken broth and tomatoes. Use any greens you like such as spinach, collard, swiss chard, mustard, watercress. Create garlic paste: Place garlic cloves and 1/4 teaspoon salt in cup and use back of a wooden spoon to crush into paste. Place garlic paste and olive oil in nonstick pan and set it over medium high heat. When garlic begins to sizzle, add spinach and remaining salt. Cook until all greens are wilted. Season to taste with balsamic vinegar. Serves 4. Bulgur wheat has twice as much fiber as brown rice! Sauté the chicken until almost done, add the mushrooms and sauté. Continue cooking until most of the liquid has evaporated then add the sauce and simmer for ten minutes. Meanwhile boil 3 cups of water in a pan, add the bulgur. Cook according to the package directions, usually about 12 minutes. Serve sauce on top of bulgur. Place 2 chicken breast halves in a gallon ziplock bag and pound each breast half to 1/2-inch thickness using a meat mallet. Sprinkle both sides of chicken with salt and pepper. Heat 1 Tbsp oil in a large nonstick skillet over medium-high heat. Place flour in a shallow dish; dredge chicken in flour. Add chicken to pan; cook 3 minutes on each side or until lightly browned. Add wine; cook 1 minute. Add olives, raisins, balsamic vinegar, oregano, basil and tomatoes. Bring to a boil. Reduce heat, and simmer 8 minutes or until chicken is done. Combine first 6 ingredients in a large bowl. Divide turkey mixture into 4 equal portions, shaping each into a 3/4-inch-thick patty. Place patties on grill rack coated with oil; grill 6 minutes on each side or until done. Place lettuce leaves on bottom halves of toasted English muffins and top with sliced tomato; top each with 1 patty and top half of bun. Serves 4. Combine ingredients together in a ziplock bag. Add chicken breasts to ziplock bag. Allow to marinade in the rerigerator for at least one hour. Remove chicken from marinade. Grill until thermomnenter inserted in thickest part of the chicken reads 160 degrees.